Stacey Abrams, the Georgia Democrat only months removed from almost becoming the nation’s first black female governor, became the the first black female to deliver a State of the Union Response. “The shutdown was a stunt, engineered by the president of the United States, one that defied every tenant of fairness, and abandoned not just our people, but our values,” said Abrams. “It should be no different in our nation’s capital,” said Abrams, speaking on how finding a path to independence is not always negotiation but understanding. While the sentiment is promising and encouraging, Abrams notices an obstructive force to this path. Abrams agreed with Trump that bipartisan immigration reform is possible, while choosing to stray from going deep into talk of investigations. Regardless of differences, Abrams did say about Trump, “I still don’t want him to fail. But we need him to tell the truth, and to respect his duties and the extraordinary diversity that defines America,” echoing the message of bipartisanship further. Touching on gun safety, Abrams noted the band-aid approach Trump is still taking in terms of offering kickbacks to teachers who complete active shooter defense training and schools who hire armed guards while not addressing the real problem, guns. Along with school, Abrams spoke on the “1.5 trillion” in student debt, something Trump did not, yet did not offer any policy measures. 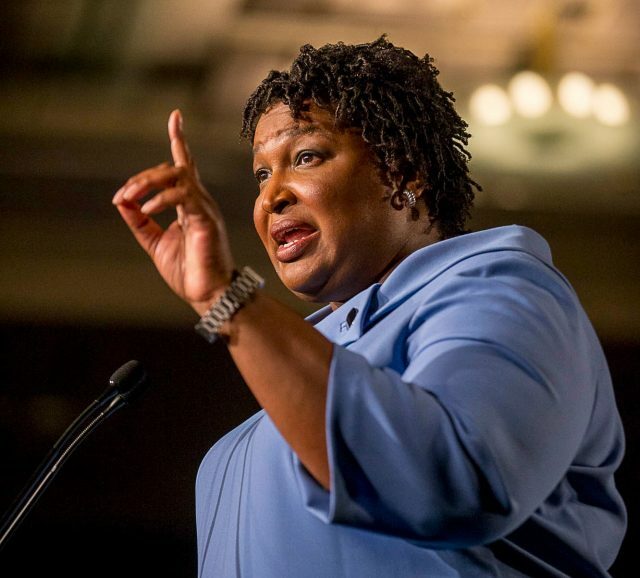 “Our leaders must be willing to tackle gun safety measures and face the crippling effect of educational loans, to support educators and invest what is necessary to unleash the power of America’s greatest minds,” Abrams said. While Trump spoke nothing of climate change, Abrams made mention of the direction climate change is heading. Wrapping up her speech, Abrams noted disagreement with the president, yet a need to still respect and work together.